We find ourselves, once again, sitting on the deck drinking our coffees. Mine with its creamer, yours black. Mornings are always nice to sit outside before the day gets too hot. And, it has been getting way too hot. Not that I mind. I like the hot, but I know most don’t, or worse, their bodies can’t handle the heat. I tell you about sitting on the deck last night with a different kind of drink in my hand. It has been a long time since I indulged in an adult beverage, maybe a year. I am not inclined to drink, so last night was the exception. People think it is odd that I don’t drink often, but I just don’t have an affinity for alcohol. You ask about my blog posts this week, or rather, the lack of them. My weekly fitness update did not get posted. It isn’t because I didn’t have any progress to post, but I’ve been thinking about switching up the Everyday Runner posts with the Fitness Update. So, instead of two scheduled posts per week discussing fitness items, I would have one, alternating between running stories and fitness updates. I ask for your advice. Would you like to continue to see two posts per week, or one alternating post per week? You comment that there was not a Book Discussion Series post this month. All I can say to that is it is coming. It will be posted before the end of the month. So will the final installment of “The Window.” If you’ve read the first two parts, you’ll want to read the third. We stop talking for a moment and watch a couple of bunnies run across the field. I tell you most nights I see deer out there. Sometimes they come up so close I could almost touch them. I wouldn’t. Ever. There used to be a fox, too, but he hasn’t been around in a long while. At least, I haven’t seen him. We look at our cups and they are empty. It is time to start the day. We lazily get up from our chairs and stretch, take the coffee cups inside, and say our goodbyes. 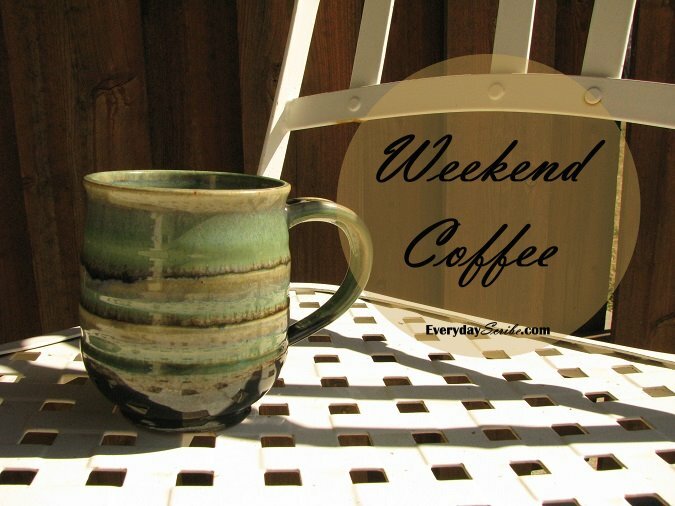 This post is inspired by #WeekendCoffeeShare hosted by Part-Time Monster. Enjoy! If you are a blogger, join in the fun! I don’t drink adult beverages. The spell of beer turns my stomach around. It is lovely to sit and watch the various animals in field. I agree with you about beer. I can’t stand the smell or taste of that stuff. Thanks for visiting and commenting!